There was once a time when it was difficult to find an air ambulance in Tallahassee, Florida. We recognized the fact that there was a void, and we gladly stepped up to the plate to fill it. Our team members are all passionate professionals, and they take a lot of pride in the work that they do. This is how we have been able to build such a strong reputation over the years. If you would like to find out what some of our satisfied customers have to say about us, take a moment to check out the testimonials page on this website. municipalities in the entire state of Florida. It is the state capital, so there are many important structures, including the Florida Governor’s Mansion. Florida State University is located in Tallahassee, so local young people do not have to go out of town to a receive top quality education. And of course, the Seminoles football team has always been a major source of pride for the city. Since it is a world-class place to call home, there are well equipped and staffed hospitals and many physicians in town. However, in some cases, the expertise that is needed can only be found in another city. 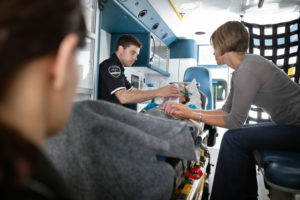 Under these circumstances, an air ambulance can be necessary, and we will always be ready to spring into action if you ever need air medical transport from Tallahassee, Florida to any other location. We can provide any level of health care attention that you need while you are on your way to your destination. Our solutions are all custom crafted to suit the needs of each respective client. This being stated, in some instances, a patient can travel on a commercial flight with the appropriate assistance. If you are in this position, we can gain an understanding of the exact nature of your situation and assign the ideal medical professional to travel along with you. You can rest assured that you will receive top notch service every step of the way when you engage our air ambulance service. Plus, you do not have to worry about exorbitant costs, because our prices are surprisingly affordable. If you would like to speak with one of our friendly, knowledgeable Tallahassee, FL air medical transport coordinators, call us right now 855-263-7215.